Boroles could be a highly interesting class of materials for practical use in photovoltaic or LED applications - if it weren't for the molecules' extreme instability. Chemists from Wuerzburg have now discovered a powerful stabiliser. Boroles are boron containing molecules that have great electron-accepting ability. This makes them excellently suited for materials that could bring further improvements to photovoltaics or OLEDs. But so far, boroles have had one major drawback: They are highly unstable and decay virtually immediately when in contact with water or oxygen. Chemists at the University of Wurzburg have now made an important step forward: Todd Marder and fellow chemists at the Institute of Inorganic Chemistry have significantly stabilised borole molecules by adding a so-called fluoromesityl group, which makes the highly sensitive boroles about 600 times more resistant to water. As a result, the molecules are stable for ten to twelve hours compared to just one minute without the stabilising group. Their electron-accepting ability is fully preserved. 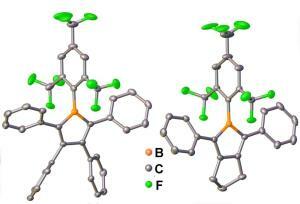 Now the new molecules&apos; robustness will be verified in further tests. The fluoromesityl boroles have proved to be heat resistant and easily vapourable. Therefore, the Wurzburg chemists are now eager to investigate whether the novel boroles can be vapour deposited on substrates in wafer-thin films. This would be a major prerequisite for technological applications. Moreover, the scientists are looking for other molecule groups that might stabilise boroles even more efficiently. Todd Marder&apos;s team with the work groups of Holger Braunschweig and Klaus Muller-Buschbaum has published the results in the magazine Chemical Science. Marder emphasises that the joint research of boroles is characterised by a great collaborative spirit which is generally true for the atmosphere at the Wurzburg department. The US chemist has researched and taught in Wurzburg since 2012. In the 15 years before, he had been head of department at Durham University in England. He also points out that the Wurzburg Department of Chemistry has an excellent global network: "Everyone here is committed to getting top-class international scientists to work in Wurzburg." The Humboldt Foundation supports this goal by awarding generous grants to postdocs. The two initial authors of the publication in Chemical Science, Zuolun Zhang from China and Robert M. Edkins from the UK, also arrived in Wurzburg with a Humboldt scholarship in their pockets. Shubhankar Kumar Bose from India joined the University of Wurzburg as a Humboldt scholar and stayed there as a postdoc. Only recently did he and Todd Marder author a comment for Science magazine: As experts in boron chemistry and boron catalysis, the two scientists had been invited by the leading magazine to assess the work of a Canadian chemist [see below]. This is another example of the international renown of the Wurzburg Department of Chemistry. Accordingly, the Department of Chemistry has achieved good ranking results in the renowned Shanghai Ranking (Academic Ranking of Universities Worldwide) of Jiao-Tong University for many years. In 2014, they ranked 30th among the more than 1,200 universities that were assessed which corresponds to rank two in the Germany-wide comparison. The Shanghai Ranking evaluates the research performance of universities according to various parameters. Taming the beast: fluoromesityl groups induce a dramatic stability enhancement in boroles. A leap ahead for activating C-H bonds.